a few discrepancies in stitch counts! which was the last design to be created. It has been designed with a slight curve to it which allows you to place a smaller design between each stitch out if you are embroidering around the hem of a skirt for example. I will show you more about how to do that later. 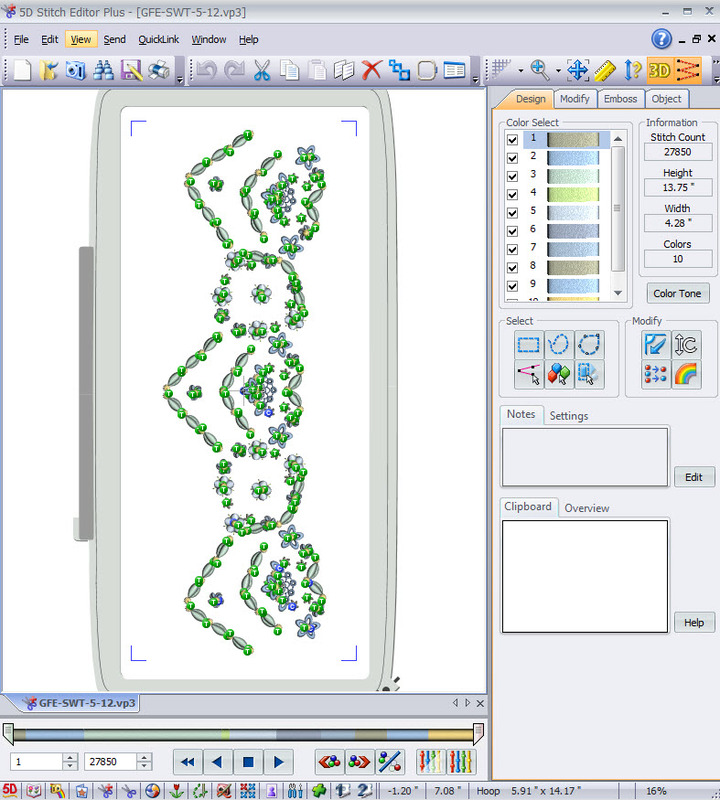 My designs are digitised with Wilcom EmbroiderySuite e3, a commercial software which is the very best. Wilcom were the pioneers of machine embroidery creating the first computer graphics embroidery design system. I do however finish off my designs with Husqvarna software as I find it offers the best sorting and colour selection tools. My images are taken from this software too. Now I have several versions of Husqvarna and this is why I am getting discrepancies in my stitch counts. There are features I prefer in the older versions so I use several of them too. When I open this design in Stitch editor in 5D, 6D and Premier I get different stitch counts every time for exactly the same design. I am glad I noticed this before I got emails to say my figures were incorrect in my PDF’s. In the new Premier software in VP4 format it has 26982 stitches, in 6D it has 26992 stitches and in 5D it has 27850 which is strange. I am not surprised at the slight difference between VP4 and VP3 in 6D but there is a large difference between the design in 6D and 5D, 858 stitches. I suspect if I look deeper I will notice other differences but this is important to me because I like my PDF’s to be accurate. There are also the competitions to consider, which I hold in my Embroidery group which often take the format of guessing the number of stitches in a design. LOL! Fortunately the design retains the stitch count when it is converted to most formats apart from the Bernina ART format. That did not surprise me at all! However I list these stitch counts with tongue in cheek, as they are not terribly important and I won’t be losing sleep over them. Only a mathematician would perhaps be bothered! (Math was my strong subject at school) It goes to prove that software and formats are improving. I am still discovering the difference in the new Husqvarna format, VP4, which holds more information on the design than the previous formats like Vp3 and VIP. Back to our design and let me show how I have designed it to be combined with smaller designs from the first set in the collection. Below you add GFE-SWT-1-32 each side as a joining piece. 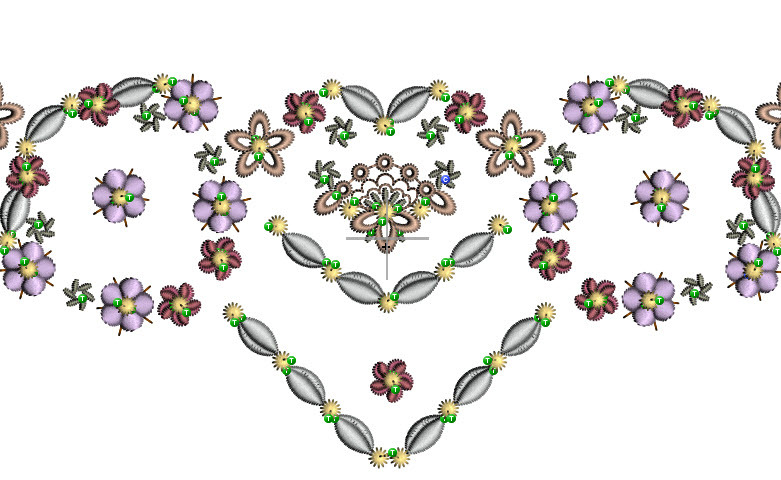 Finally I also tried the heart in this collection, GFE-SWT-1-7, but I am sure these are not the only designs that will work well as a linking design. When I stitched this design out I used a different selection of colours. I used Sulky Rayon 1229 Light putty and 1070 Gold as I had for the other designs, but I changed 1104 for Medium tawny tan 1056, 1051 became Medium orchid 1031, the two tone flowers were stitched in Dark mauve 1119 and Dewberry 1304, the double seeds were embroidered in Silver grey 1218 and the lace type petals in Medium Dark Ecru 1054. Notice how different the actual stitch out looks colour wise from the image created in my software. These designs will be released on Sunday 10th January, 2016. View the other sets in the collection here. 6 Responses to a few discrepancies in stitch counts! 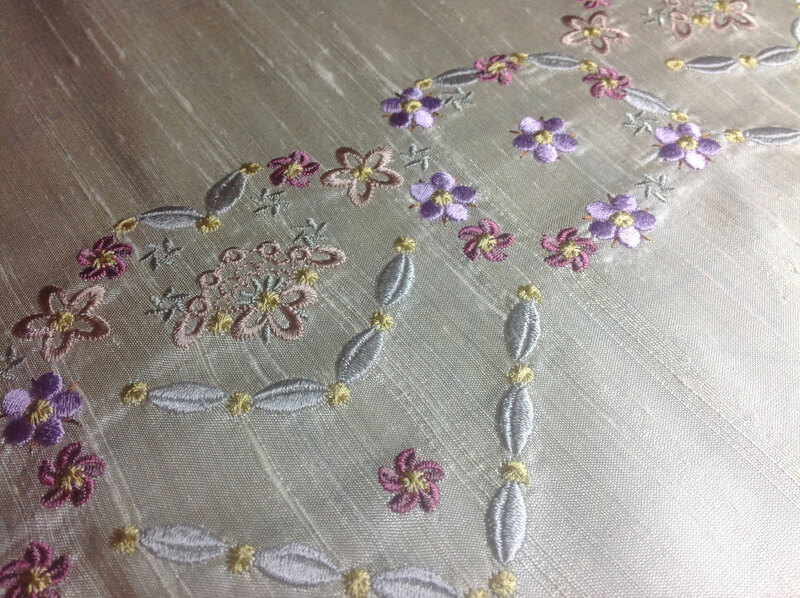 I use Sulky Rayon 40 and this design was stitched out on silk dupion using a layer of Sulky soft n sheer stabiliser. I hoop my stabiliser and then place the fabric on top and attach to the stabiliser using my Outline alignment stitches or the basting box on my machine. I now use my foot pedal for this as it gives me more control over the speed. Hazel, Do you think that the discrepancy among the embroidery software’s is because of counting jump stitches? It could also be because of stitches I call – “getting to start” place. One of my software’s will create from 1 to 5 stitches just going to the start position. You could end up with very different numbers for total stitches if the total includes jump stitches. My software has a setting for the number of stitches or mm it will do before a jump stitch. I can change that number and I’m sure the recommended settings on new machines are different with different hoops. I don’t have a machine that cuts jump stitches but I think that would cause a difference especially in the formats for the larger designs and the newer machines that handle the big hoops. The settings may have fewer jump stitches if it cuts the jump stitches than software set up for an older format and smaller hoops. Good luck with this quandary.. I am sure you are right and I will be looking into this dilemma further so as to understand my software more fully and get the best results! Thank you for taking the time to share your thoughts. I also have given some thought to this issue, and think it may be related to differences in the algorithm used by software engineers in their product design. I suspect there is no industry standard at this time for the number of stitches in a defined space so each company’s software specialists essentially write their own design algorithm. Until software companies develop a stitch count standard, the end-user will continue to experience count variances. While I understand company to company differences, there should never be significant version-to-version differences within one product line. I wonder if Husqvarna has an explanation for this. Yes that’s an interesting point. One day I shall take a small design and test it out in the various formats. Within one format, say Husqvarna, each new format holds more info. I need to get to grips with the new VP4. Thank you for taking the time to read and respond to my blogs. Happy embroidering!